Special” sightseeing at the House of Gaius Julius Polybius and the House of the Chaste Lovers: the domus of Julius Polybius is the first one with multisensory visit, while in the site/event of the House of Chaste Lovers, you can live personally the work of archaeologists and restorers. 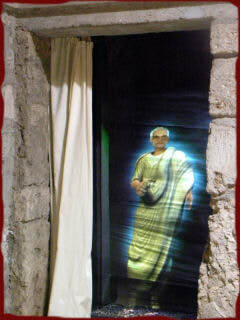 The hologram of Gaius Julius Polybius, the rich freedman landlord of the homonym domus, will accompany visitors in the most important places of his residence, until the last room where he fled with his family at the time of the eruption and where it was found a young pregnant woman who returns to live into a hologram. In an hour you can watch the daily life of the inhabitants of the house till the tragedy of the eruption. The visit to the site/event of the House of the Chaste Lovers reserves, instead, the sensation of living an archaeological discovery, thanks to the work of archaeologists and restorers. Through a system of suspended bridges, you can see from above, perfectly preserved, the oven of the bakery, the two stables with animal skeletons, a garden faithfully recreated and the beautiful frescoes and mosaics. A series of multimedia technologies offers a virtual reconstruction of the function of the different environments. The works will be visible from Via dell'Abbondanza through transparent panels.